Ed Welburn spent 44 years in the General Motors design department. The legendary GM designer was inspired to work for the company after seeing the Cadillac Cyclone concept at the Philadelphia Auto Show as a young boy. Welburn got his dream job in 1972, when started as an Associate Designer in the GM Advanced Design Studio before being moved to the Buick exterior design studio where he helped design the new Buick Riviera and Park Avenue. He then spent over 10 years designing for Oldsmobile, where he penned the painfully cool Aerotech speed record car, the Antares Concept and the production Intrigue, among more. Welburn then put in a short stint at Saturn in the mid and late 1990s before being appointed as the Vice President of GM Design North America on October 1, 2003 – making him just the sixth GM design leader in history. More impressively, he was also appointed as the first person to lead GM’s entire global design portfolio in 2005 and sat on the company’s Executive Leadership Team. 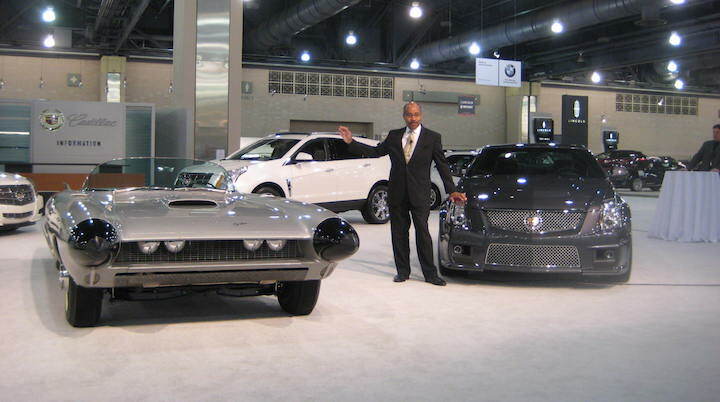 Welburn and the car that started it all for him – the Cyclone Concept. Welburn retired from the company in 2016, but as he explained in a recent interview with local Detroit automotive talk show Autoline After Hours, there are some designs he was heavily involved in before he retired that still haven’t come out. One car that he had a particularly heavy influence on was the next-generation Corvette due out this year – which should be welcome news for anyone who was a fan of the Welburn-era of GM design. Welburn also touches on some other interesting topics including what he thinks of current GM designs, what car he wants back, the new technologies that are available to car designers, the future of auto shows and more. You can watch the hour plus long interview with Welburn embedded above – if you appreciate insights into the past, present and future of GM, you won’t want to miss it. Legendary? When I think of Legendary auto designers from GM I think Harley Earl, Bill Mitchell, Larry Shinoda and even Jerry Palmer. Ed Welburn had a long and successful career at GM, made his mark and I applaud his efforts, but I guess I don’t consider him a “legend”. If ‘legend’ means the stuff you can actually get produced, ya, Ed was a victim of the system. But all those game-changing Cadillac concepts (Elmiraj, etc), the gull-wing Riviera rebirth, and more that ended up on the cutting room floor – he was an artist whose best work never saw the light of day. And a really good guy, as well. One has to wonder what direction General Motors would take if the GM Board of Directors replace current CEO Mary Barra with Ed Welburn.. one has to remember that all of the miserable failures in recent years was given the greenlight for production like Cadillac’s CT6 instead of the Ciel concept car. Really interesting. Apparently he doesn’t think much of the XT6, he thinks very highly of GM’s Chinese designers (Blazer/FNX-R anyone? ), is producing a movie that he can’t talk about (the Hot Wheels thing??? ), likes what Volvo and Tesla are doing for the most part, really liked the gen 5 Camaro (as did I) and doesn’t think GM should abandon the 69’s influences (I think it’s time to turn the page), he thinks the C8 (which he watched over) is going to look great (I have serious reservations), implies that he dislikes Lexus grilles, that Audi designs are strong but invisible (I agree), likes Infiniti’s recent concepts (so do I), likes a lot of what Kia is doing (so do I), and seems like a really likable guy (my opinion). I have much respect for Ed’s accomplishments, but think GM’s designs became more and more hit and miss as his tenure rolled on, and that there are/were a lot of misses at the end of his reign and that GM’s designs rank very near the bottom of the pack today overall, and that some of their best work misses the mark in some areas. Super nice guy, though. He seems very much like the kind of person I would want to work for if I was a designer, and I’m sure he’s done more amazing work than I realize (he’s certainly done amazing work over the years). I just dislike too much of what GM has done recently. But I guess you can’t please everyone. When it comes to cars it is a crap shoot. You can draw a great car but getting it produced can be difficult if there is no path to production. Also what looks good today will it play well 5 years from now and for the 4-5 years it is in production. I found his observation on how most SUV models today are the size of what cars were in the past. This fits the pattern on how truck sales took off as RWD cars sales declined. Ed had a tough job. He wanted to bring new product to GM but much of his era was constrained by the lack of money. In the Earl and Mitchell era they had massive power. During the Jordan era the power to the designer declined. I do not believe we will ever see a designer as powerful as Harly or Bill. I will be looking forward to a book from Ed. He has always had good observations and always has a good story to tell. His passion for cars is passed on with his stories. Interesting but even in retirement, Wellburn remains very guarded. I can’t imagine trying to make it through the book he is writing unless he’d be willing to be more forthcoming. I think we’d all love to hear the backstory on some of GM’s disasters like the Aztek but he really wasn’t willing to say much. I think that speaks to the controling GM culture that he had to work within and still very much rules him today. My sense is that in the days of Mitchell, the VP of Design had a lot more freedom to speak freely and even be critical of GM. I’ve read many of his behind-the-scenes assessments of what went wrong on designs. Welburn stayed very protective of the company in this interview. I don’t think Earl and Mitchell were quite so subject to the ‘design by committee’ handcuffs as Ed was. GM was making big money as Scott said. Design had a seat at the table, and you’d have to guess Earl and Mitchell had (and won, and lost) their share of arguments. The Aztek was, as I understand it, a Reuss labor of love. It’s found an audience now (an audience with a sense of irony) – kinda like when 16 oz PBRibbons found favor with the hipster, anti-craft brew crowd. I wasn’t so much saying Welburn’s work was bad although he’s certainly no Bill Mitchell. Rather I was commenting on his unwillingness to say anything of substance about GM. He gave us a bit of insight into the GM-10 Cutlass Supreme from 30 years ago which I found interesting but that was about it. I’d love to hear more about the stories behind the cars. He simply wasn’t very forthcoming. At the outset, Peter DeLorenzo stated his disappointment with the XT6 and Welburn wouldn’t defend it or comment on it at all other than to say it was a product Cadillac needed. Well, why is it so uninspired looking and derivative, we’d like to know. Was it packaging constraints, designed for Chinese tastes, what exactly. I’d like to know. He made no comment. I’m not entirely surprised that he can’t comment on a current product but he seemed unwilling to say much about anything, about any designs from his 42 years with GM. By contrast, Bill Mitchell did an interview with the Henry Ford Museum after his retirement and he was much more open, even criticizing the then-new cars (among them, the ’86 Riviera) on their way to production. History would prove his insights correct on those cars as GM was about to embark on a long downward decline for which design played a large role. Maybe Wellburn is saving all the interesting stories for his book. Obviously I don’t know but an honest and candid conversation with Wellburn would truly be fascinating. As a fan and outsider I would like to get in there and cuss out designers in the hope of shaking things up, but I suspect he took the opposite approach and kept quiet on many occasions so as not to stifle others creativity. If that’s the approach he took it was probably the right one, but as someone that grew up with so many cool vehicles in my youth, not to mention cool concepts, I can’t help but wish he had used the words of JDN and pushed harder. It’s unfortunate but I suspect GM’s upper management doesn’t know the meaning of pushing harder. I suspect they’re out of touch, if not completely dispassionate about their products, and that design, engineering and other departments all operate as their own little fiefdoms, and that those within them fear rocking the boat and losing their seat on the gravy train.